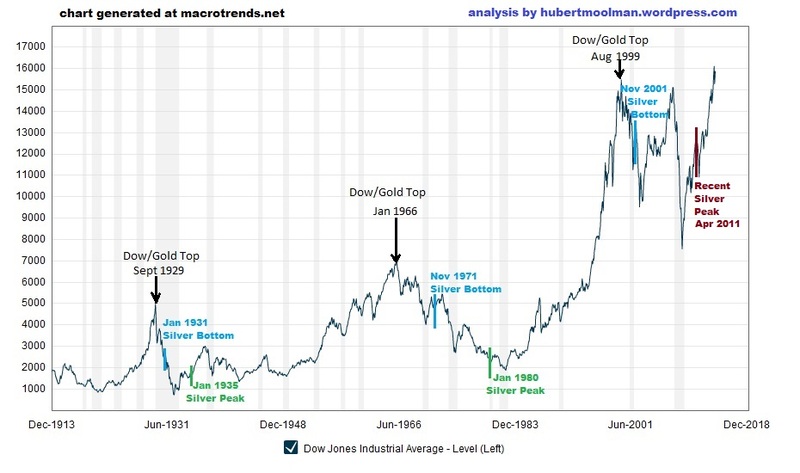 In September 1929, the Dow peaked in terms of US dollars as well as in terms of gold ounces (real terms). After about 1 year and 4 months, silver made a significant bottom. While the Dow continued to fall for most of the time, silver rallied until it peaked in January of 1935. 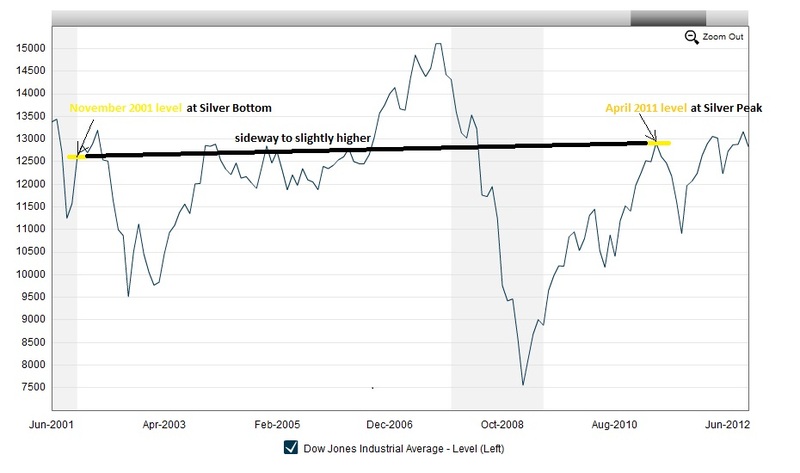 At silver's peak, the Dow was about 30% lower in real terms than what it was at silver's bottom. Again, in January 1966, the Dow peaked in real terms. After about 5 years and 10 months, silver made a significant bottom. While the Dow continued to fall for most of the time, silver rallied until it peaked in January of 1980. At silver's peak, the Dow was about 55% lower than it was at silver's bottom. This is just one of the reasons why I know that the April 2011 high in silver is not the peak for this bull market. Why? Silver stands in direct opposition to paper assets like stocks that are part of the Dow. Therefore, when silver has a “real deal” rally, then paper assets like the Dow will lose significant value over the same time. This is because the debt-based monetary system does what I call a “mirror-effect”, whereby, silver (and gold) is pushed down in value, to a similar extent as to which paper assets such as general stocks are pushed up in value. When the rally of the paper assets eventually runs out of steam, then there is a big push for silver and gold. Silver's real deal rally will happen when people run to silver for its monetary benefits. That is not really happening yet, in a big way, but it is about to – very soon. Money is what silver is, and it is this that will drive the coming spectacular silver rally. 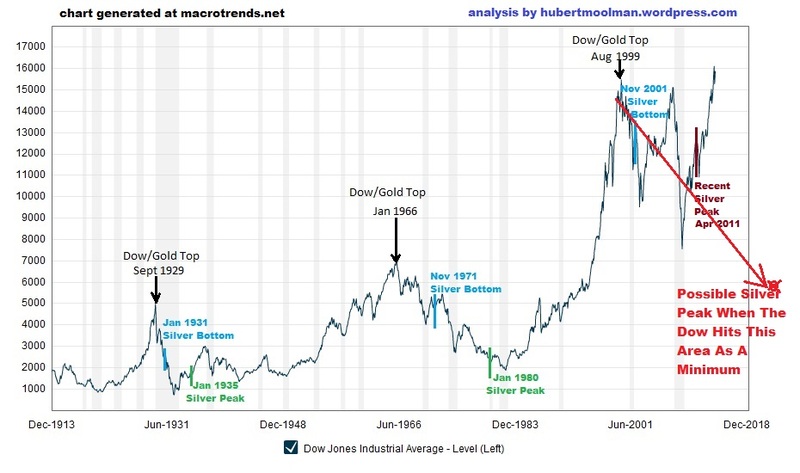 So, if we look at the Dow chart again (below), one can see that the silver peaks of the 70s and 30s occurred when the Dow was trading closer to the lower levels of its range. Currently, the Dow is trading at all-time high levels. If the Dow is currently having a “real deal” rally, then it means we are going to have to wait a long time before silver has its real rally. However, if the Dow is just having a fake rally, then silver will spike as soon as the Dow's fall gathers steam, and possibly peaks when the Dow hits a level indicated on the chart, as a minimum. One, therefore, has to decide whether this Dow rally is real or fake. I have recently completed a Long-term Silver Fractal Analysis Report.